Many Evertonians didn't know quite what to make of plucky Joe-Max Moore when he first arrived on Merseyside on a free transfer from Major League Soccer side, New England Revolution in November 1999. Walter Smith made his introduction to Premiership football slow and progressive, and it paid heavy dividends, with five goals in consecutive matches, and 8 in all by the end of his first season. And some of those goals were crucial, especially his first � an injury time equaliser at home against Tottenham in January 2000 which preserved the Blues' then unbeaten Premiership home record. Scoring late goals as a sub, and adding one in only this, his second full match, dispelled the initial reservations Evertonians had about the nippy little Yank, who's attitude is always exemplary. Moore's signing owed much to Richard Gough who had spent a season in the MLS with the San Jose Clash (later re-named the Earthquakes) before returning to the UK with Everton, via a short spell at Nottingham Forest. It was on Gough's recommendation that Smith sign the American striker and he proved to be a useful squad player with a knack for scoring at the right time. Dangerous at set pieces with a powerful shot, Joe-Max Moore offers more than just goals. He is versatile and has played five different positions (defensive mid, central/creative mid, attacking mid, right mid, and forward) for the US National Team. Although not seriously considered to be the best American striker, he does seem to have that knack for banging in the goals and stands in 2nd place in the USA's all-time scoring list. He even scored the two goals that secured the USA's place in the 2002 World Cup Finals. He's a hard worker � sometimes too hard for his own good � who has the ability to fill a lot of roles in the midfield or up front. He can be lethal on direct kicks around the area. He's not the type to carry a bad team on his shoulders, but can help make a good team very good, something he proved in one of his and Everton's best performances, a 4-0 drubbing of West Ham at Upton Park during which Joe-Max was phenomenal in tandem with Nick Barmby. Unfortunately, his inability to transform a game on his own has made limited his inclusion in the starting line-up to times of emergency when the first choice strikers are injured. 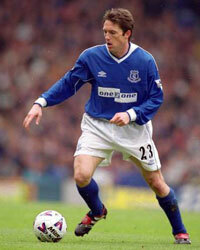 Many would argue that his strike rate � superior to that of Duncan Ferguson, for example � merits an extended run in the team, but Moore has found it difficult to score goals consistently. Indeed, his crucial strike against Derby County at Goodison in December 2001 after coming on as a second-half substitute was his first in 18 months. He scored again in the next game but that would be his last for Everton. He played on for the rest of the season, but became increasingly less effective, and only made the subs bench briefly under David Moyes. He remained on Everton's books well into the new 2002-03 season, eventually being released to go back home to the States for Christmas 2002. 1996-1997 Zemelec (Ecu, on loan) ?? ? ?